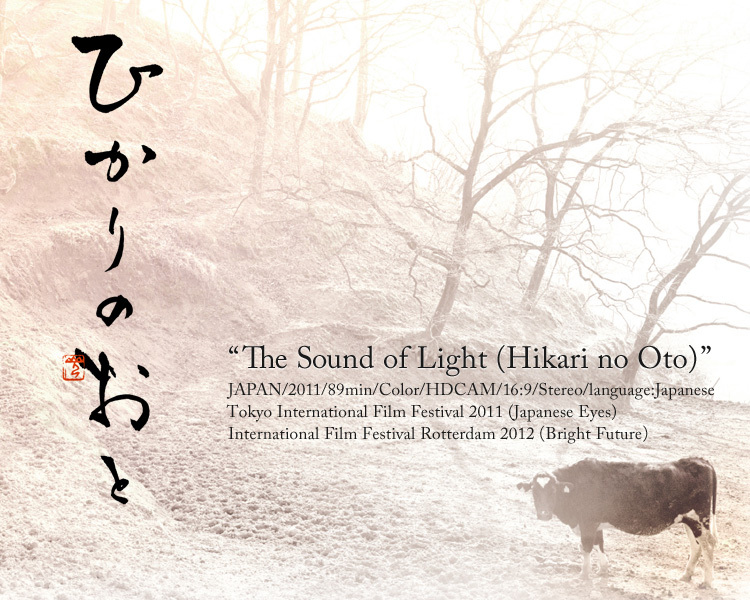 "The Sound of Light (Hikari no Oto) "
Deep in the mountains of North Okayama Prefecture, a young farmer tries to make a new life for himself while dealing with the weight of family obligations. He wanted to make music in Tokyo but has returned to the small family farm that has been passed down for generations. "The Sound of Light" (Hikari no Oto) reflects the difficulties faced by those who work the land, anxiety about a future that cannot be predicted, and facing up to family struggles. The first feature-length film by writer/director Juichiro Yamasaki, a farmer himself, reveals the tangled life of a young dairy farmer and his hopes for the future from the point of view of those who make their living from the earth. The Kariya family has run their dairy farm for generations in the mountains now carved into pieces by an expressway. Their eldest son, Yusuke, had dreams of becoming a musician in Tokyo, but has been called back to the farm by an injury to his father. But his dreams of making music have not faded, and uneasy thoughts about the future with his girlfriend Yoko are making him question whether he can handle life as a dairy farmer. Yoko and her former husband Natsuo had a young son, Ryota, before Natsuo was killed in an accident. Natsuo's mother wants Ryota to carry on the family name. Before his death, Natsuo wanted to be a dairy farmer as well. He often helped Yusuke's uncle Yoshiyuki on his farm. This tangled net of relationships and obligations has left Yusuke feeling trapped. The Kariya family has a tradition of watching the first sunrise of the New Year together. This time, Yusuke's sister Haruko is bringing her boyfriend back to meet the family. It seems like just another ordinary New Year's holiday until a fire breaks out on Yoshiyuki's farm. Born in 1978 Osaka, he coordinated 'Kyoto international student film and video festival' and more film events. He also participated in some independent films by Houbei Satou as an assistant director. Now he lives in Okayama, his father's hometown to be a farmer and organized the film production and exhibit team 'cine/maniwa'. His directorial mid-length film "The Fall Leaves (2008)" won the independent festival Cinedrive2009 special awards. "The Sound of Light" is his debut feature. Hikari no Oto. This title refers the sound of light that showers upon the earth. It cannot be heard, but when you really strain for the sound, you may be able to feel it. This movie features a family in the countryside facing an uncertain future, the obligations unique to life in a small town and the harsh realities of life. But it was never my intention to show living in the heart of the mountains in a negative way. I only hoped to capture the sound of light. As a farmer myself, I believe that as long as the sun rises crops can grow and people can be happy, no matter their situation. I wanted Yusuke, the main character of this movie to discover his own, simple way of living, where he can think for himself and not be influenced by the material concerns of everyday life. I hope to connect with any person who might be living in a similar situation. The sound of light is there for all of us. On March 11th, there was a terrible disaster caused by an earthquake. The events at Fukushima continue to spread out, polluting the soil and the sea. Chaotic feelings spread out from me in many ways but eventually returned and brought the realization of how powerless we truly are. At the same time, I made sure I could still rely on the important things that existed before the 11th. The sun's light will not stop. I wish the light that pours from a blue sky could be the energy of all things. It's only one movie, but I believe there are many things that one movie can accomplish. Copyright©2011-2012 youkouproject All rights reserved.